Late on 4 July, a filament eruption took place near the solar disk centre. No x-ray flare was recorded, but SDO/AIA 304 imagery (temperatures of about 80.000 degrees; inner solar atmosphere) showed some weak flare ribbons, whereas the SDO/AIA 193 images (temperatures of about 1.25 million degrees; hot outer solar atmosphere) revealed post-eruption coronal loops, as well as obvious coronal dimmings ("transient coronal holes") indicating that a plasma cloud had been ejected. See the images underneath about 1.5 hours before and after the start of the eruption. 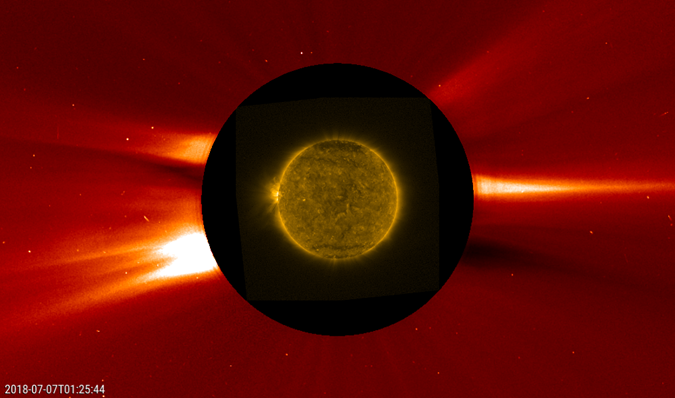 The coronagraphs onboard the SOHO spacecraft did not catch the associated coronal mass ejection (CME). 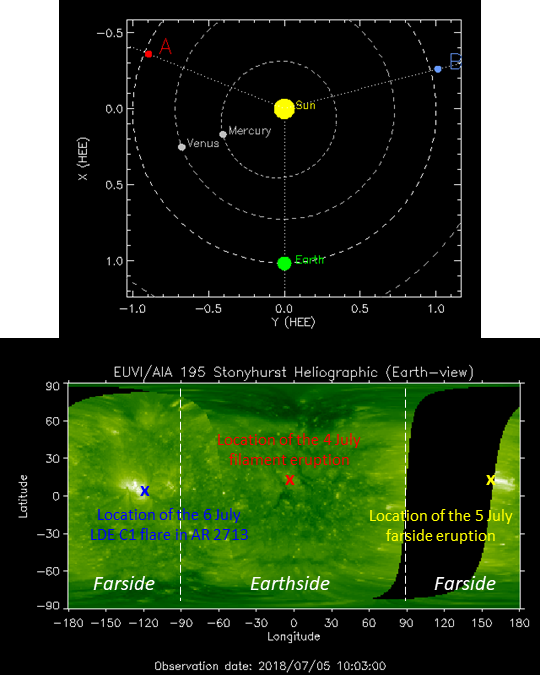 However, thanks to STEREO-A, a satellite currently observing the Sun from about 21 degrees behind the eastern solar limb as seen from Earth (see chart underneath for location of STEREO-A ("A") and Earth), a very slow and narrow CME could be seen leaving the Sun starting at around 03:24UT on 5 July. According to CACTus, the CME had a plane-of-the-sky speed of only 183 km/s and a width of 36 degrees. It is very likely this weak CME had an earth-directed component. Around 10:30UT on the same day (5 July), the EUVI (Extreme Ultraviolet Imager) onboard STEREO-A recorded some coronal dynamics near its east limb. This position clearly indicated that this was a farside event (see map above), explaining why the event left no x-ray signature in the x-ray flux as observed by the GOES satellite. The associated CME was the most obvious of the week, with a plane-of-the-sky speed around 400 km/s and a width of about 90 degrees (CACTus). This CME was clearly not directed to Earth. In the coronagraphic imagery underneath, this CME can be seen in ST-A images (top) moving to the left, and in SOHO/LASCO images (bottom) moving to the right. 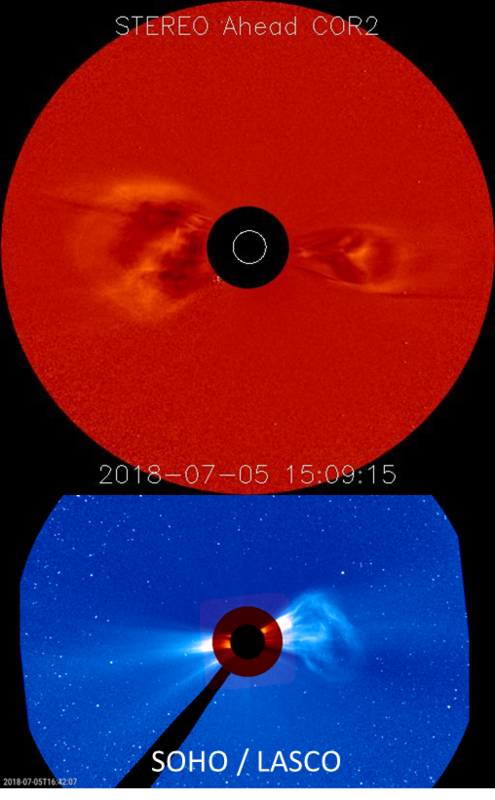 The CME moving to the right in the STEREO-A image is the slow-moving CME from early on 5 July which is still in the coronagraph's field-of-view. 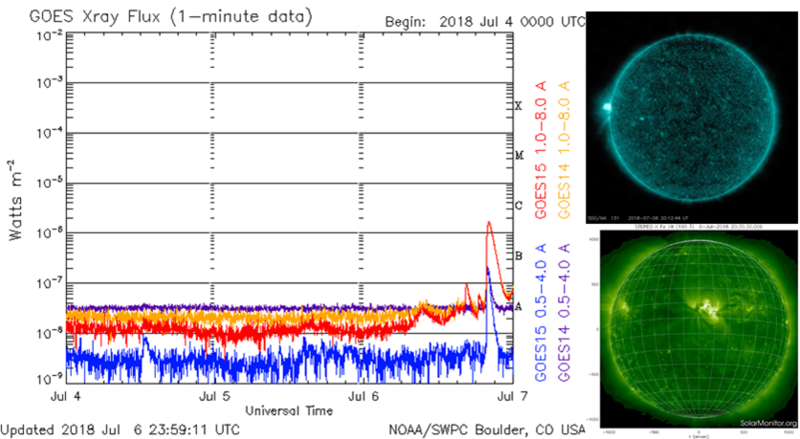 On 6 July, the GOES spacecraft registered a long duration C1 flare, the first C-class flare since 6 June. 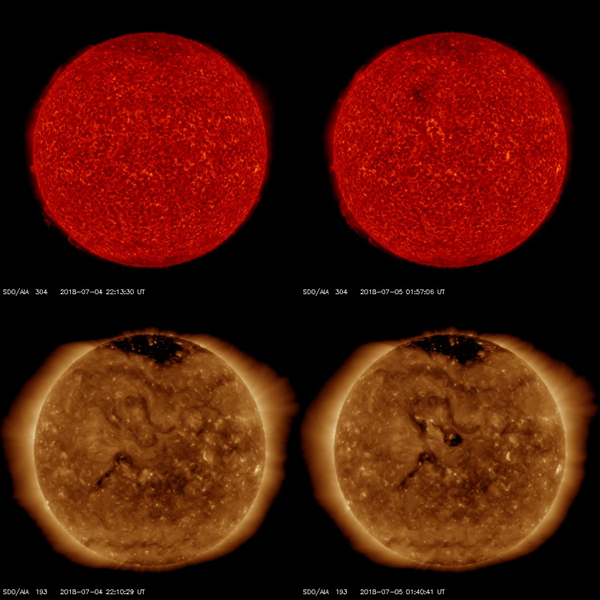 SDO images indicated the flare having its source behind the east limb, and this was indeed confirmed by STEREO-A which shows some brightening in the leading portion of a bright active region. This was decaying active region NOAA 2713, which had nearly completed its farside transit at that time, but was still some 10 to 20 degrees behind the east limb as seen from Earth. As seen from STEREO-A, the eruption took place near its central meridian. No obvious coronal dimming seems to have been associated with this C1 flare, but a faint CME was observed in LASCO coronagraphic imagery (not detected by LASCO). The picture underneath combines PROBA2/SWAP imagery with SOHO/LASCO-C2 images. The slow-moving CME is faintly visible from around 00UT till 03UT on 7 July, moving to the east (to the left in the images). Movie clips of this CME as well as on on the aforementioned events can be found underneath.